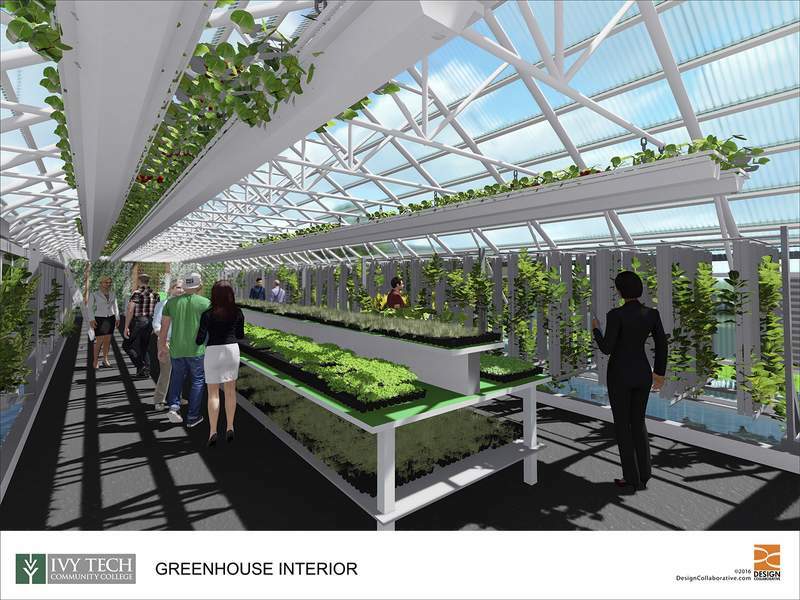 Courtesy Set for completion this fall, the greenhouse on Ivy Tech's Fort Wayne campus will let agriculture majors conduct experiments and grow produce for hospitality administration majors to incorporate into their cooking assignments. Describing the facility that's under development at Ivy Tech as just a greenhouse seems like an understatement. The structure, which is on the southwest corner of The Steel Dynamics Inc. Keith E. Busse Technology Center, won't be like any other offered at other Ivy Tech campuses. None have the hydroponics capabilities – growing plants with water and no soil – and the aquaponics systems – hydroponics assisted by farmed fish – the Fort Wayne campus will boast, said Kelli Kreider, the agriculture program chair. The college can “integrate so many components in this facility, it's incredible,” she said. The more than 3,000-square-foot greenhouse is being financed by $486,000 in donations and grants from private individuals and foundations. Ivy Tech this month recognized Old National Bank for its contribution. It is donating $50,000 in the next three years toward the greenhouse and $11,000 during the same time frame to provide scholarships for Easterseals Arc of Northeast Indiana clients who will participate in agriculture and culinary training programs, according to a news release. Kreider anticipates the greenhouse will boost enrollment. “We also hope to attract a different audience wishing to learn how to grow food using non-traditional farming methods,” she said, noting new classes will include greenhouse management, hydroponics and wine appreciation. Lettuce, herbs and tomatoes will be among the initial staples, Kreider said, indicating a desire to maximize production. Hospitality administration majors will use the produce in cooking assignments, she said, and the food might even benefit the college's food truck. “It's a learning process for all of us,” she said. Eventually, she said, the greenhouse should be self-sustainable. The college hopes to install solar panels and a wind turbine in addition to collecting rainwater from the gutters for use elsewhere, she said. “The possibilities are endless,” she said. The campus's existing greenhouse, which is about as small as Kreider's office, will continue to be used for soil-based plants, she said. The greenhouse is expected to open with a formal dedication this fall. 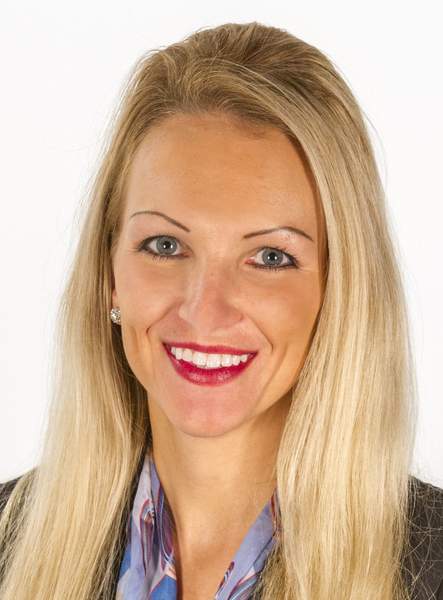 “It's going to be a state-of-the-art facility that our college and city can be proud of,” Margaret Sturm, executive director of resource development, said in a statement. The Riley Children's Foundation recognized South Adams, Bluffton-Harrison, Garrett-Keyser-Butler, Hamilton Community and Southern Wells Community schools as Red Wagon Corporations for their philanthropic efforts supporting Riley Hospital for Children during the 2016-17 school year. The school systems, which participated in the statewide Kids Caring & Sharing program, achieved this status by raising at least $1 per enrolled student. Only 15 of Indiana's more than 290 school corporations achieved the designation in 2016-17. Since the program's 1985 inception, Indiana's K-12 schools have raised more than $16 million to benefit children and families receiving care at Riley Hospital, with more than $670,000 raised in the last school year. Huntington University's doctorate of occupational therapy program is offering an additional spring cohort start for the three-year, full-time program held from 8 a.m. to 5 p.m. weekdays with class and laboratory experiences. Classes are held at 1819 Carew St., Fort Wayne, on the Parkview Randallia Hospital campus. Prerequisite coursework and a bachelor's degree are required. For more information, visit www.huntington.edu/OTD or attend an OT Preview Day on Sept. 22, Nov. 3 or Dec. 1. Contact graduate@huntington.edu or 800-600-4888 to RSVP. Concordia Lutheran High School welcomed several new educators this year: Kelly Beverly, English; Chris Murphy, theater, math and theatrical arts/auditorium manager; Kylee Heisler, art; Betsy Ladwig, English; and Reese Breischaft, computer science teacher assistant. Class began Aug. 10. • Bishop Luers High School received a grant through the Florence M. and Paul M. Staehle Foundation. The funding will be used to buy Surface tablets, which will assist the Bishop Luers Academic Success program. With the devices, teacher aides may record information about students' academic needs and provide reference information for the teachers' planning purposes. The grant is administered through PNC Charitable Trusts. • The family of Paul J. Haughan has established the Paul J. Haughan Memorial Scholarship for a Bishop Luers High School student. Haughan, who was born in 1930, was generous to nonprofits and felt an obligation to help the needy. When he attended Central Catholic High School, his tuition was paid by a friend, and it was his desire to assist students in need at Luers. Ivy Tech Community College's Fort Wayne campus will offer noncredit personal enrichment classes this fall. The September classes are “That's My Jam: Canning and Food Preservation” from 6 to 9 p.m. Sept. 20 and a self-discovery seminar called “Gettin' Real: Being Your True Self” from 8:45 a.m. to 6 p.m. Sept. 23 and 30. Both are held at the Coliseum Campus, 3800 N. Anthony Blvd. Costs and registration deadlines vary. Visit www.IvyTech.edu/northeast/living for more information or to register.